Posted in General Health & Wellness on July 14, 2011. Last modified on January 31 2018. Read disclaimer. The global economic dust hasn't yet settled, but that doesn't mean that you can't start the new year off on the right financial foot. By sticking to a budget, being savings savvy and keeping your credit clean, you'll be off to a great start. January can be a great time to reassess your budget, or create one if you don't have one in place. By creating a budget, you can determine exactly how much you can reasonably spend, and how much you can save. Subtract your monthly expenses -- this includes house/car payments, utility bills, insurance, etc. Allocate money for groceries, fuel, savings, entertainment, etc. Keep track of your spending and review your budget every month to see where you can make any necessary modifications. Financial experts recommend that you work towards saving enough to cover expenses for at least three months. But don't stop there if you can do more. Allocate a set amount of money to contribute to a retirement plan each month (10% of your income is recommended). If your employer doesn't offer a plan, consider Individual Retirement Accounts (IRAs). 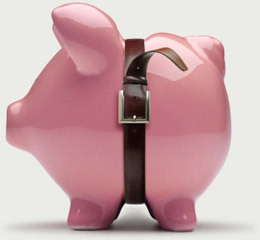 Transfer a pre-determined amount of money from each paycheck into a savings account. From there, divide it into categories: auto repair, medical costs, clothing, gifts, annual expenses such as property taxes, etc. Have you checked your credit report lately? Though you may not be seeking a new loan or service that requires a credit check, keeping an eye on your credit will help you quickly detect any fraudulent activity, and ensure your credit history is accurately reported. Under the United States' Fair Credit Reporting Act (FCRA), you're entitled to access your credit report for free from each of the three nationwide credit reporting agencies Experian, Equifax and TransUnion -- every 12 months. Visit AnnualCreditReport.com or call 1-877-322-8228 to get your report. In Canada, you may obtain a free copy of your credit report as long as you get the report mailed to you. For online viewing, you will have to pay a fee. Contact the two credit agencies in Canada to get your free reports: Equifax Canada (1-800-465-7166, equifax.ca) and TransUnion (1-866-525-0262 for all provinces except Quebec or 1-877-713-3393 for Quebec residents. Their website is transunion.ca). If you spot inaccurate information in your report, contact the reporting agency in writing and provide supporting documentation. You will also want to contact the creditor or other entity providing the inaccurate information. If you suspect your identity has been stolen (e.g., your report shows a credit card you didn't open), contact the reporting agency and request that a fraud alert be put on your report, close the fraudulent account and file a police report. In the U.S., you will also want to file a complaint with the Federal Trade Commission at ftc.gov/idtheft or call 1-877-IDTHEFT. In Canada, contact the Canadian Anti Fraud Centre at 1-888-495-8501 and Reporting Economic Crime Online at recol.ca.